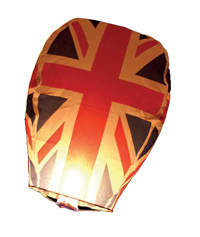 We are giving away Free Union Jack Sky Lanterns to our Facebook fans for the Diamond Jubilee! If you have liked us, then come and claim your free lantern. Whether the lanterns are launched one by one or all together, they are sure to create a stunning effect in the sky for your group to enjoy. Let your friends know and they too can claim their FREE Sky Lantern.